Sunrisers Hyderabad came into play in 2013 when Deccan Chargers were terminated. Kumar Sangakkara was named as the captain at the start but was later replaced by Cameron White. Sunrisers reached the Qualifiers in that season but Rajasthan Royals defeated them by 4 wickets in the Eliminator. In the following season, they ended at the sixth position. Shikhar Dhawan and Darren Sammy led the side in 2014. 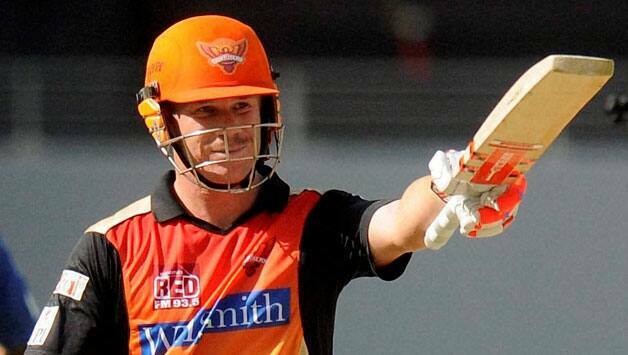 Sunrisers got their fifth captain in their third season in 2015. David Warner was given the big role now. However, the team again finished at the sixth position. Yuvraj Singh - The 34-year old stylist left-hand batsman still has it him to turn the tables for his team. He may not be in the best of form but on his day Yuvraj can tear apart any bowling attack. Ashish Nehra - The other big name that the Sunrisers have bought is Ashish Nehra. He is another of those cricketers who have proved to the world that age is just a number. At 36, the left-arm fast bowler still bowls with the same zip. His recent form has earned him a spot in World T20 XI. Mustafizur Rahman - The 20-year old left-arm medium-fast bowler has emerged as a sensation for Bangladesh. The guile with which he bowls in the shortest formats seldom allows batsmen to score runs off him. Ben Cutting - The 29-year old all-rounder from Australia has represented Rajasthan Royals in the past. He bats right-handed lower down the order and bowls right-arm fast-medium which makes him a complete package for T20 cricket. Abhimanyu Mithun - The 26-year old right-arm medium pacer is a renowned name in Indian domestic circuit. He has represented Mumbai Indians and Royal Challengers Bangalore in the past. Barinder Sran - The 23-year old left-arm medium-fast bowler from Punjab made debut for Rajasthan Royals in the last edition of IPL. Having played for India at the highest level now, he will be high on confidence. Aditya Tare - The 28-year old wicket-keeper from Mumbai will contest for the wicket-keeper's spot with Naman Ojha. Apart from the duty behind the stumps, Tare also performs well in front of them. Tirumalasetti Suman - The 32-year old right-handed batsman generally bats up the order and takes full adavantage of the powerplay. He has played for Deccan Chargers, Mumbai Indians and Pune Warriors India in the past. Deepak Hooda - The 20-year old right hand batsman became popular in the last edition of the IPL for his big hitting. He also bowls right-arm off-spin and is an acrobatic fielder, making all the more important for Sunrisers. Vijay Shankar - He is another all-rounder who bats right-handed and bowls right-arm medium pace. Having represented Chennai Super Kings in the past, he has started to make a name at domestic level. David Warner will have to play the dual role of a captain and an opener. In addition to these 10 players, Sunrisers have 13 others, which makes a healthy total of 23 (16 Indian + 7 Overseas). They will have the services of their skipper, David Warner, at the top of the order. To go along him will be Shikhar Dhawan. They also have England's ODI and T20I captain, Eoin Morgan. The triplet has had a disheartening ICC World Twenty20. So, it is important for them to revive and find ways to score quick runs for their franchise. Kane Williamson is both capable of rotating the strike and and playing the big shots after settling in. He can be used as a at No. 3 around whom the whole batting line-up will rotate. Yuvraj will play a paramount role in the middle order. Like his batting, his left-arm spin will also be beneficial for Warner. Moises Henriques all-around skills will also come handy for the team. Naman Ojha, 32, has been around Indian domestic cricket for more than 15 years now. His experience will also be useful for Sunrisers. He will, perhaps, be given a go ahead of Tare for the duty behind the stumps. Ricky Bhui, 19, who represented India U-19 in the ICC U-19 Cricket World Cup earlier this year, has a lot to learn from all the international stars. He may be tried in the middle order at some point of the tournament. To string along Nehra, Rahman, Mithun and Sran in the fast bowling department, will be Bhuvneshwar Kumar and Trent Boult. Warner would want to use the international experience of the pair in the powerplay and at the death as well. Ashish Reddy has been with the Sunrisers since 2013. He will also get a match with his right-arm medium-pace. The 25-year old Siddarth Kaul is another able medium pacer for the Sunrisers. Sunrisers has only two specialist spinners in Karn Sharma and Bipul Sharma. Both can be serviceable with the bat down the order, which is an added advantage for the team. The proficient Tom Moody is the Head Coach of the team. Simon Helmot will give him assistance. The bowlers will have a master in Muttiah Muralitharan to aid them. VVS Laxman is the Team Mentor. Sunrisers Hyderabad might not have many captivating names is their squad but if they do justice to their potential with whatever resources they have, they might be on the road to win their maiden IPL title.